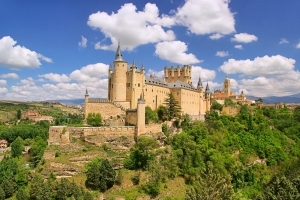 A magnificent composition of the Mudéjar and Gothic styles, a picturesque location on a crag at the confluence of the Eresma and Clamores rivers, the rich interiors of the chambers, artistically crafted over centuries, century after century, for the royal family – all these attributes belong to the Alcázar of Segovia. 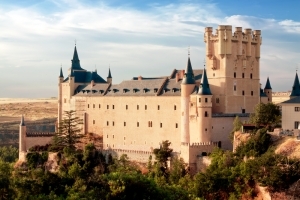 For many centuries, this important gem of architecture was the residence of monarchs of Castile and León, who finally turned this unknown stronghold from the early Middle Ages into one of the most fascinating castles in Spain. 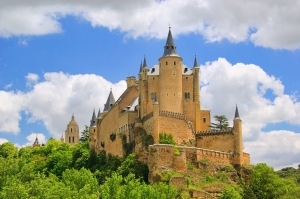 In the 20th century the castle became a popular museum and together with other buildings in the old city centre of Segovia entered the UNESCO World Heritage List. 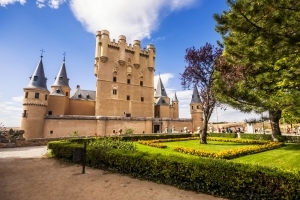 The long history of the Alcázar of Segovia is reflected in many splendid rooms built in different periods and various styles – adequately to the spirit of these periods. 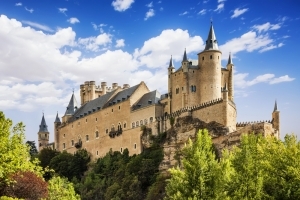 When visiting the castle, visitors can see 11 magnificent rooms and an artillery display and climb up the Juan II Tower, which once served as an arsenal. One of the oldest rooms in the castle is the Hall of the original palace, dating back to the times of King Alfonso X. This room is also known as the Hall with Venetian stained glass windows, you can also see the old rosettes (flower-shaped ornaments) decorating the space between the windows. A collection of suits of armour in the style of German knights from the 15th century is also displayed in this room. The Chimney Room was built in the times of King Philip II, and the interior and the furnishings suit the design of the 16th century. The extremely rich decor of the Throne Room looks impressive. You can enter the Throne Room from the Fireplace Room, going through a Mudéjar portal. Here you can see old portraits of a Catholic royal couple – Isabella I and Ferdinand. The two thrones with the crest and motto of Catholic monarchs were created in honour of Isabella I and Ferdinand in the early 20th century, the day before King Alfonso XIII and his wife Victoria Eugenie of Battenberg visited the Alcázar. October – March – from 10:00 a.m. to 6:00 p.m.